So for 41 days until Earth Day, we publish here the 41 best replies we receive, one reply a day. All replies are gathered and presented on the Earth Day 2011 page. Thank you Penny for sharing with us your thoughts on planting trees for your books! We want to mention again the great prizes we give away on this campaign, courtesy of our partners. Winners can choose their prize from a great list of gifts including audiobooks from Simon & Schuster Audio (such as The Half Life by Jennifer Weiner, Left Neglected by Lisa Genova and Essence of Happiness by the Dalai Lama) and great books, like Planet Home by Jeffrey Hollender, Spit That Out! by Paige Wolf, Menu Dating by Tristan Coopersmith and The Healthy Home by Dave Wentz and Dr. Myron Wentz. You can see the full list of the prizes on the campaign's page. 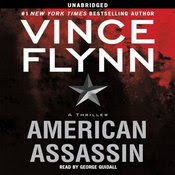 American Assassin by Vince Flynn - #1 New York Times bestseling author Vince Flynn introduces the young Mitch Rapp on his first assignment, a mission of vengeance that made him a CIA superagent— and a terrorist's worst nightmare. Two decades after the Cold War, CIA Operations Director Thomas Stansfield must prepare his people for the next conflict. The rise of Islamic terrorism is coming, and it needs to be met abroad before it reaches America's shores. Stansfield directs his protÉgÉe, Irene Kennedy, and his old colleague, Stan Hurley, to form a new group of clandestine operatives—men who do not exist—who will work outside the normal chain of command. Kennedy finds the ideal candidate in the wake of the Pan Am Lockerbie bombing terrorist attack. . . . Among the thousands of family and friends grieving the victims is Mitch Rapp, a gifted college athlete, who wants only one thing: retribution. Six months of intense training prepare him to bring the war to the enemy's doorstep, and he does so with brutal efficiency, leaving a trail of bodies from Istanbul and across Europe, to Beirut. But there, the hunter becomes the hunted: the enemy has prepared a trap, and the American assassin will need every ounce of skill and cunning if he is to survive the warravaged city and its deadly terrorist factions. If you want to participate in the campaign, we still have some spots available so please send us your reply, either by adding a comment here or sending it to info@ecolibris.net. We look forward to hearing from you. I think your readers will enjoy an EARTH DAY virtual field trip to New York City . Learn about the Window farm Project. Learn about the joys and challenges of hydroponic gardening in small spaces.